"Most bands can't get the New Orleans stuff right, but the Revolutionary Snake Ensemble is one of the few who does and then takes it in fascinating directions." 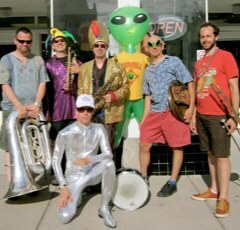 After crowd-stunning performances this summer at the UFO Festival in Roswell, NM and the Festa del Redentore in Venice, Italy, New England Music Awards nominee Revolutionary Snake Ensemble returns to Regattabar for a costumes-optional Halloween throw-down on Friday October 31st! Guest soloist Jon Bernhardt will supply appropriately scary and spooky sounds via his theremin, one of the world's earliest electronic instruments, which is magically controlled without physical contact by the thereminist. The group has performed at the Kennedy Center for the Performing Arts, the Brooklyn Academy of Music, Tipitina's, the Museum of Fine Arts Boston, and many other venues. Notable guest musicians who have appeared with RSE include Charles Neville, Trombone Shorty, Kenny Wollesen, Matt Darriau, and Josh Roseman. Their most recent CD "Live Snakes" received airplay on over 100 radio stations throughout the US and Canada, received an Editor's Pick in Downbeat, and was listed on the CMJ Jazz Top-40 chart for almost 3 months. The New Orleans magazine "Offbeat" called it "a stone cold killer diller!" Jon Bernhardt has been playing theremin since 1996 with such bands as The Lothars, The Pee Wee Fist, and UV Protection. As a solo performer, he specializes in theremin versions of songs that are completely inappropriate for that instrument, although he's been known to throw in a few standards to keep the audience on their toes. When not playing the theremin, he DJs an indie-rock radio show at WMBR-FM in Cambridge.